CraigsList has got a reputation as a hangout for flakes and shysters. If you’ve tried to get work through CraigsList, this might have been you’re experience, but it is still a place to find some filmmaking bargains. One of those, I suggest, is Lowel tungsten lights. Lowel lights have fallen out of favor in recent years as people have been looking for ‘cooler’ (pun intended) alternatives. Florescents, CFLs and, especially, LEDs are the flavor of the day. Each has its pros and cons but compared to the workhorse Lowels they’re all expensive and delicate. 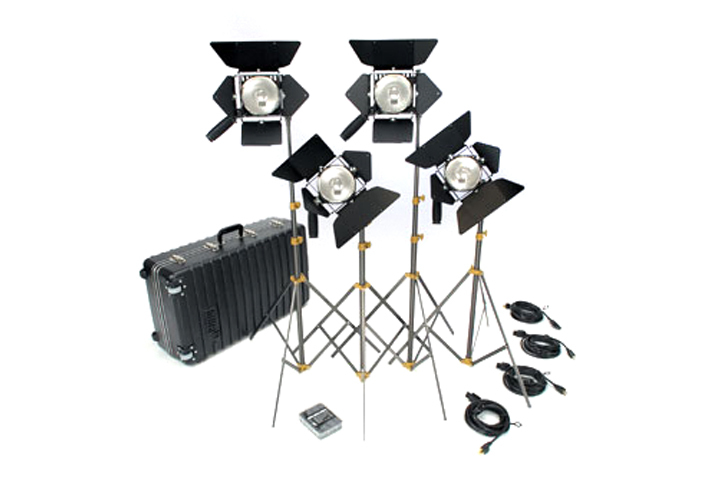 Lowel light kits were the go-to lights for video journalists, students and corporate professionals for years. The reasons that that was true, are same reasons you should think about adding a Lowel light kit to your arsenal: they’re cheap, tough, adaptable and have great quality to the light they produce baked in. About 1/10 the cost of the new kit, and still going strong. Because they’re so tough, and they have been sold for so many years, they are plentiful and you can still easily find parts to fix or replace anything that is broken or misplaced in an old kit. Because they’re not very fashionable, you can find decent kits for cents on the dollar and CraigsList would be my shopping venue of choice. You could try eBay, but kits can be heavy, so shipping charges can be prohibitive. The advantage of CraigsList is that you can pick them up locally and you check that they’re as described when you do. I just picked up a Lowel Omni 4 kit, just like this kit B&H sells for $1,241, except that mine was made in the late 90’s and contains a few extras, like some light modifiers, and bares the scars of use. My cost was, $140 and a gallon of gas. At that price, how can you go wrong? Guerrilla filmmakers have always looked to the Hardware Store for cheap equivalents of expensive film tools, but you ‘d be hard pressed to get a set of halogen work lights for this money and the Lowels are made for filmmaking, not for lighting job-sites. I did quite a deal but, with a little patience, you can find something similar. I bought mine from a college that was selling off it’s hot-hot lights. Many companies, organizations and individuals are doing the same. You can find pre-packaged kits, like I did, or pick up odd lights here and there. Don’t be afraid of a few battle scars and evidence of heat. These lights were built to take abuse and you can still get just about every part you need to fix something broken in that abuse goes too far. Don’t worry about evidence of them running hot – they were designed to run this way. A brand new light only needs to be run for a few hours before you know it’s not new anymore. 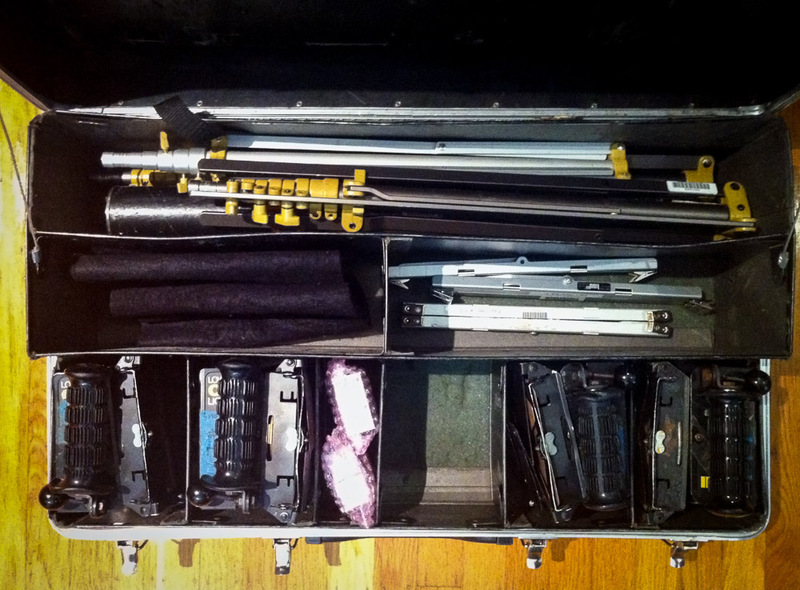 The advantage of the prepackaged kits is that they come in a very solid flight case. They’re not light (another intended pun) but it’s amazing to be able to pack the majority of your lighting gear in one suitcase-sized case and throw it in your trunk. I’ve added a couple of Totas and some other modifiers and accessories to my ‘standard’ kit and I can still shut the case and lift it. That said, the modern cases have retractable wheels and handles; older kits do not. While you can carry them in hand short distances, a lightweight luggage cart or trolley will make life much more pleasant. What my kit would have looked like new. There are sexier lighting kits if you have money to burn, but the workhorse Lowel light kits are still worth a look even in the days of LEDs and CFLs. If you have no other choice, you can get replacement bulbs from your local Calumet but at $29 each they are not cheap (update: which is probably one reason that Calumet is no longer in business). For that price, even taking shipping and tax into account, you can get 4 bulbs from Amazon. It pays to always have a couple of spares in hand so that you don’t have to rush out to a local store and pay their huge markup. The bulbs are delicate, especially when lit. Just lightly kicking a stand when a lamp is lit can be enough to blow the bulb. Turn off lights and let them sit for a minute before breaking down lights or adjusting them. If you must change focus of the bulb while the lamp is lit be gentle. If you move lamp focus while the lamp is lit, quickly from one extreme to the other the bulb will blow. Always have the protective screen in place. Sometimes, when these bulbs let go, they do so explosively. The safety screens will stop hot glass shrapnel flying around your set. The fixtures get very hot, very quickly. Don’t try adjusting the barn doors without gloves or a C47 at the very least. Don’t leave the lights unattended or close to anything that could catch fire. Be careful that the modifiers you use are suitable for hot lights (softboxes that can survive this kind of heat are expensive). Don’t touch the bulbs with your bare fingers. Oil from your skin compromises the bulbs performance and will shorten it’s life. Use suitable dimmers to extend bulb life. Reducing the output by 20% will make the bulb last quite a bit longer. It has the added bonus of reducing the heat you are pumping onto your set. Sand bag light stands, especially if they’re near any thoroughfare, or if they have large modifiers in place. Similarly, tape down stingers and other power-cords.